REDEFINE magazine is pitching “Mystical & Spiritual Ideas In Modern Music”, a SXSW 2013 panel that will explore how creation is influenced when musicians have strong foundations in the metaphysical. Artists will share how spiritual beliefs affect musical creation and its end goals, how it supports transformation on individual and cultural levels, what role rituals and symbols play in art, and how to balance intent and intuition in the artistic process. If you support our panel concept, please view its full description and vote for it at http://panelpicker.sxsw.com/vote/3484, between August 13th and August 31st, 2012. 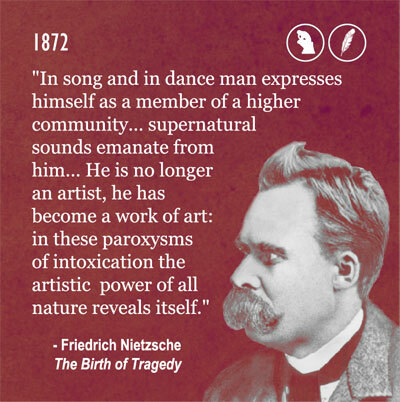 To drum up support for this panel, we have also created an infographic of quotes from great musicians, writers, artists, scientists, and philosophers, to timeline how the connection between music and spirituality has changed through the years. Below the jump, you can see the full graphic, which features 32 influential creators ranging from Ludwig van Beethoven to James Joyce and Albert Einstein, John Cage to Joseph Campbell and Flying Lotus. SEE IT HERE.